This research article analyzes the performance of a systematic global macro investment strategy investing in multiple in publicly traded securities across the world. The strategy invests in all asset classes, including Equity, Fixed Income, Commodity, Currencies, and Volatility. The strategy performance is compared to a traditional equity portfolio, represented by the S&P 500, and to a 60/40 portfolio invested in both equities and bonds. The article is structured as follows. 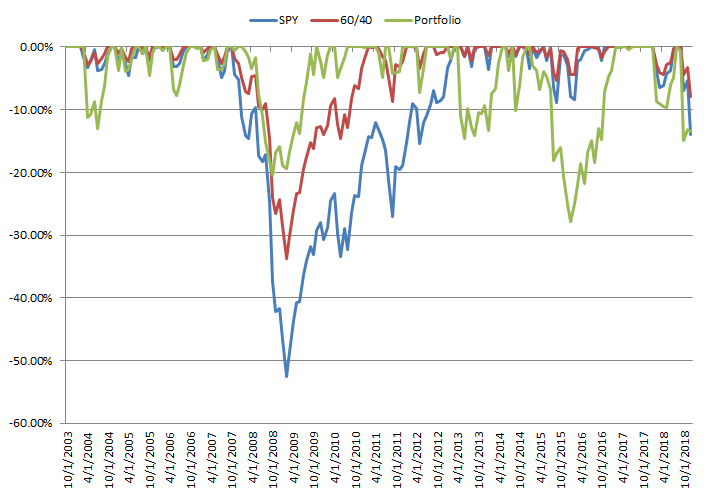 The first section analyzes the performance of equities as represented by the S&P 500. The second section analyzes the performance of a 60/40 portfolio, frequently used as a benchmark for institutional investors. The third section compares the performance of a hypothetical systematic global macro trading strategy compared to a passive investment in the equity market or a 60/40 portfolio. The fourth section concludes with key takeaways. Figure 1 shows the performance of the S&P 500 from January 1950 until December 2018 on a log scale. 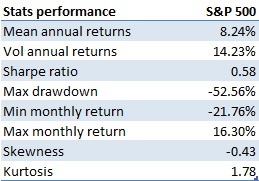 Figure 2 shows the drawdown for a long-term buy and hold strategy in the S&P 500, while Table 1 shows its drawdown statistics. As it can be seen from them, a buy-and-hold investment in the S&P 500 experienced significant drawdowns, with a max drawdown of 52.56%. 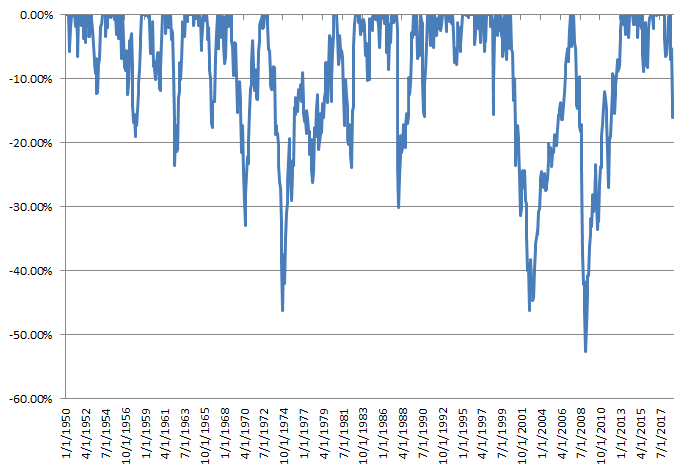 Some drawdowns were also quite long to recover, with the max drawdown with a length of 7.5 years. This data shows that while it is true that most of the time the equity market goes up, it is also important to try to avoid investing all the money in the stock market since it could take a long time before the investor can recover his losses. 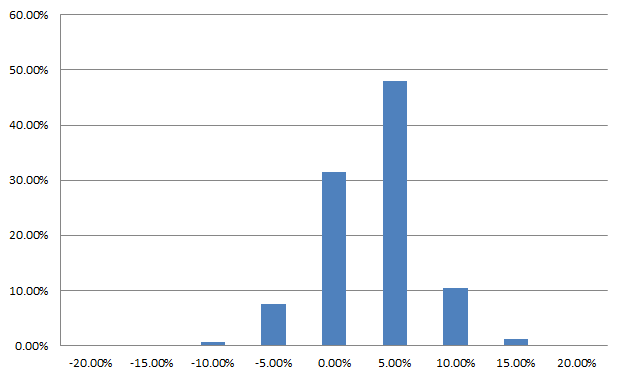 Figure 3 shows the distribution of monthly returns for the S&P 500. Table 2 shows the performance statistics of a buy-and-hold investment in Bitcoin during the considered period. As it can be seen from it, the US equity market provided an average annual return of 8.24% during the period, with a volatility of 14.23%, leading to a Sharpe ratio of 0.58. Also, the return distribution is negatively skewed, due to the presence of small positive returns and large and fast negative returns when a recession or market crash happens. In summary, investing in the stock market require an investor to have a long-term horizon of at least 5 years, due to the presence of long and big drawdowns. The next section will analyze whether it is possible to improve the performance of a passive equity-only investment by adding bonds to the portfolio. 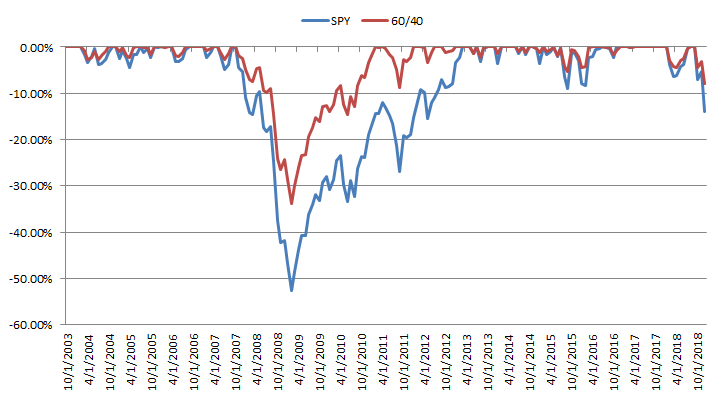 Figure 4 shows the performance of a static buy-and-hold 60/40 portfolio (60/40) from October 2007 to December 2018. The portfolio invests 60% in the equity market, as represented by the S&P 500 (SPY), and 40% in the bond market, as represented by the Barclays Aggregate Bond Index (AGG). This portfolio is typically held by institutional investors and usually considered a diversified portfolio and used as a benchmark. Figure 5 shows the drawdown for a long-term buy and hold strategy in the S&P 500, while Table 3 shows its drawdown statistics. As it can be seen from them, a buy-and-hold investment in the 60/40 ha better drawdowns than the S&P 500, with a max drawdown of 33.72% compared to 52.56% for the S&P 500. The drawdown length also improves, going from a max drawdown of 5.3 year to 3.25, a reduction of around 40%. 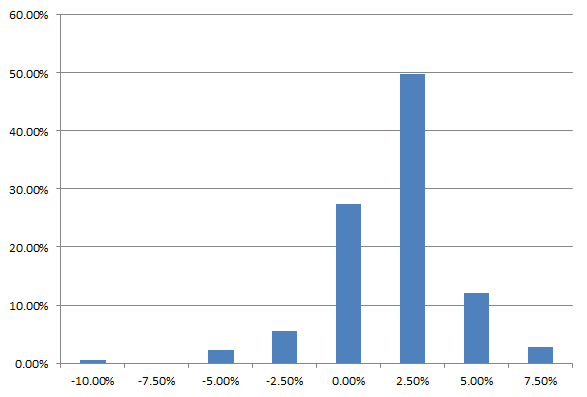 Figure 6 shows the distribution of monthly returns for the 60/40 portfolio. 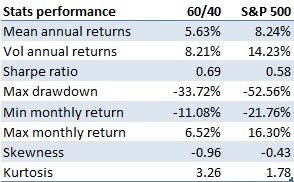 Table 4 shows the performance statistics of a passive buy-and-hold investment in the 60/40 portfolio during the considered period, compared to the S&P 500. As it can be seen from it, a 60/40 portfolio delivers less return compared to the US equity market, but at the same time is less risky. This delivers in the end a slightly higher Sharpe ratio of 0.69, improving the return per unit of risk taken. This results stems mainly due to portfolio diversification by investing in an uncorrelated asset. 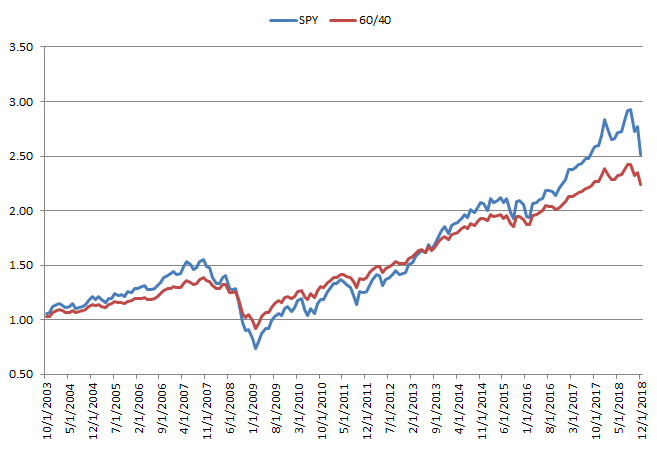 In fact, the average correlation between the equity and bond market during the analyzed period is 0.01, indicating that they are uncorrelated. This improves the efficient frontier and provides a better risk-adjusted performance compared a pure equity investment. In summary, investing in a 60/40 portfolio reduces drawdown width and length and improves the Sharpe ratio, at the expense of less mean annual returns. The next section compares the performance of a 60/40 portfolio and the equity market to an active quantitative global macro investment strategy, to see it the expected performance can be improved. Figure 7 shows the backtested performance net of transaction costs of a systematic global macro investment strategy from October 2007 to December 2018. The strategy invests in publicly traded securities globally across all asset classes, including Equity, Fixed Income, Commodities, Currencies, and Volatility. The strategy has a fixed target volatility of 15% in order to have risk comparable to an equity market investment as represented by the S&P 500. Figure 8 shows the drawdown for the systematic global macro investment strategy compared to the S&P 500 and the 60/40 portfolio. Table 5 shows the drawdown statistics for the 3 investment portfolios. As it can be seen from it and from Figure 8, the portfolio has much lower and faster to recover drawdowns. The max drawdown is in fact 27.79%, almost half compared to 52.56% for the S&P 500. The drawdowns are also faster to recover both on the max and mean measures. The max drawdown length is in fact 2.16 years, compared to 3.25 years for the 60/40 portfolio and 5.3 years for the S&P 500. Table 6 shows the performance measures for the 3 strategies. As the table shows, the systematic global macro strategy outperforms both a passive equity market investment and the 60/40 portfolio on both the return and per amount of risk taken. On the return side, it achieves an annual average return of 17.88%, more than double both the S&P 500 at 8.24% and triple the 60/40 portfolio at 5.63%. On the risk side, it has around the same amount of volatility of the equity market per construction. As a result of the better return delivered with around the same amount of risk, the strategy achieves a much better Sharpe ratio of 1.12, compared to 0.58 for the equity market and 0.69 for the 60/40 portfolio. As previously indicated, the max drawdown is also much less and faster to recover. In conclusion, based on the previous results, even after transaction costs the systematic global macro investment strategy proves to be superior both on return and on a per unit of risk basis compared to a passive long-term investment in the S&P 500 and a 60/40 portfolio. Equities deliver around 9% annually, but have very long and large drawdowns: while it is true that in the long run an equity investor can expect to obtain around 9$ per year, it also experiences quite long and max drawdowns. 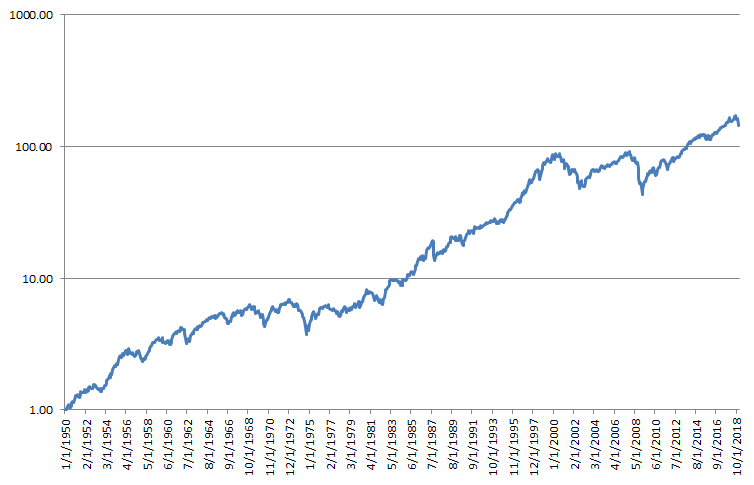 In fact, the max drawdown for the S&P 500 was 52.56%, with a length of 7.5 years. 60/40 portfolio improves the risk-adjusted performance of an equity-only investment thanks to portfolio diversification: by investing bonds, which are uncorrelated to the equity market, and investor can achieve better risk-adjusted performance compared to an equity market investment. 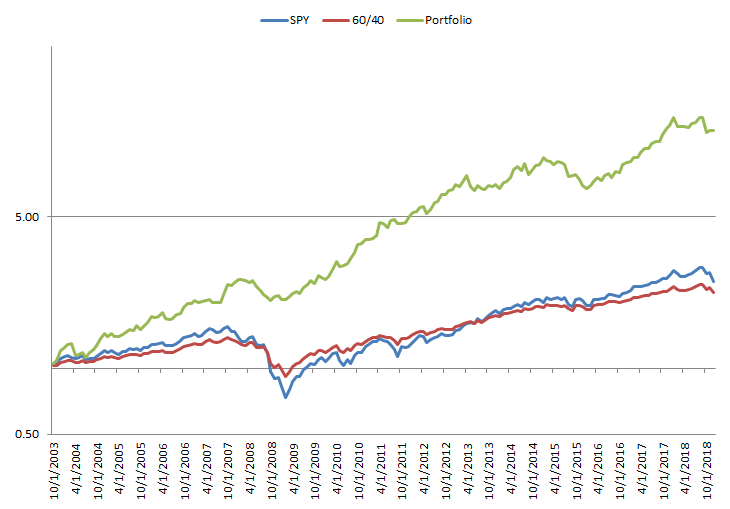 In fact, the Sharpe ratio for the 60/40 portfolio is 0.69 compared to 0.58 for the equity market. At the same time, both expected returns and volatility decrease, with an expected return of 5.63% for the 60/40 portfolio compared to 8.24% for the S&P 500. Systematic global macro investment strategy is expected to achieve better risk-adjusted performance than the equity market and a 60/40 portfolio:by investing in multiple asset classes globally, an active systematic global macro investment strategy can potentially deliver better risk-adjusted performance. The backtested Sharpe ratio is in fact 1.12, compared to 0.69 for the 60/40 portfolio and 0.58 for the S&P 500. It also delivers shorter and smaller drawdowns, with a max drawdown of 27.79% and 2.17 years compared to 52.56% and 5.33 years for the equity market.